Here are the best downtown Las Vegas hotels that put you in the middle in the Freemont Street Experience. Families who are looking for more onsite amenities should try the Golden Nugget Hotel, the Plaza Hotel or the D Hotel. 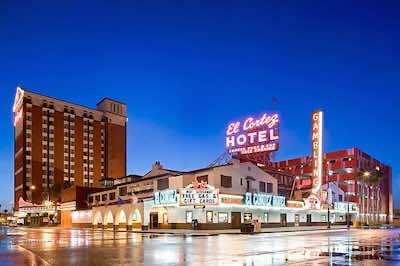 If you are looking for a historic property with roots to the early days of Las Vegas then a super choice is the El Cortez Hotel, the Freemont Hotel or the Golden Gate Hotel. Trendy boutique hotels like the Thunderbird Hotel and the Oasis at Gold Spike are ideal for trendy adults looking for value. Older adults are comfortable at the California Hotel and the Main Street Station Hotel. When you are looking for a comfortable place to recharge at a budget price try the Downtowner Motel or book at the Four Queens Hotel. The Golden Nugget Hotel is an ideal downtown Las Vegas hotel which has plenty of onsite amenities and is superb for families as well as all types of travelers. Located in the center of the Freemont Street Experience, the Golden Nugget Hotel has 1,914 rooms and suites which boast a contemporary interior. There are eleven categories of rooms available with varying amenities from VIP passes to discounts on spa treatments to no resort fees. The average room size is 364 square feet with a choice of bedding and views of the pool area or skyline. The one-bedroom Rush Tower Corner suite has a separate living room and panoramic views. The one-bedroom Parlor and Spa suites are 1,200 square feet of living space on two-levels with a separate living room, floor to ceiling windows, some units offer an in-suite Jacuzzi and you have views of the Shark Tank freshwater swimming pool as well as the skyline. 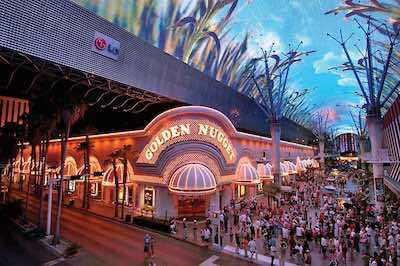 The Golden Nugget Hotel has a lively atmosphere and is close to many nearby attractions such as the Discovery Children’s Center, shopping at the Las Vegas Premium Outlet Mall as well as you are right across the street from SlotZilla Ziplines within the Freemont Street Experience. The Golden Nugget downtown Las Vegas hotel has numerous onsite amenities which start with two freshwater swimming pools that include an adults-only as well as a family pool with a Shark Tank and waterslides. There is an arcade for children, a fitness center and full service spa onsite. Dining at the Golden Nugget Hotel includes nine restaurants from the Chart House to Vic and Anthony’s Steakhouse to Grotto Italian Ristorante to the Claim Jumper. Other dining choices onsite include Lillie’s Asian Cuisine, Red Sushi, the Cadillac Mexican Kitchen, the Grille and there is a buffet restaurant. Nightlife at this popular downtown Las Vegas hotel onsite includes Gold Diggers Night Club, the Showroom features live music from top notch bands and you can party at the Ice Bar, Claude’s Bar, H2O Bar, Cadillac Tequila Bar and the Rush Lounge. If you are searching for a budget downtown Las Vegas hotel which has a lively casino area and is close to all the action of downtown then the Four Queens Hotel is a perfect choice. Located in the heart of the Freemont Street Experience in downtown, the Four Queens Hotel has 690 rooms as well as suites that have been recently renovated with a contemporary decor. Rooms in the North and South Tower range in size from 290 to 325 square feet with a choice of bedding. Royal and Regal suites are between 620 to 650 square feet with an open floorplan that has a living area which contains a sofa sleeper. The big draw at Four Queens Hotel is the casino area where you will find mostly older adults playing the various table games and slot machines. 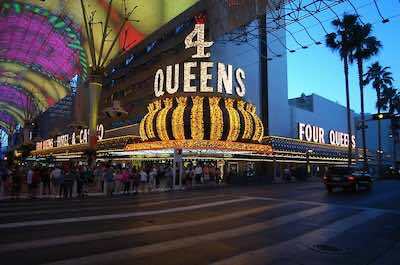 The Four Queens downtown Las Vegas hotel is situated within walking distance to many attractions such as the Downtown Las Vegas Event Center, Bootleg Canyon Flightlines and Stars of the Strip. There is not a freshwater swimming pool or fitness center onsite but you have access to the facilities at its sister property the Binion's Gambling Hall. Dining onsite includes Magnolia’s Veranda which is open 24/7 for all three meals as well as the Chicago Brewing Company is open for lunch and dinner. There is also Hugo’s Cellar which is an old school steak house open for dinner. Nightlife includes drinks at the Patio Bar which open into the Freemont Street Experience where you will find plenty of entertainment venues in the evening or you can try to catch the Mike Hammer-Comedy and Magic Show as well as the Spirit of the King which are performing at the onsite Canyon Club. 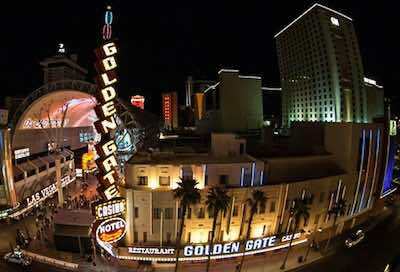 When you want to find a mid-range boutique downtown Las Vegas hotel which is historic, lively and in the center of the action then you should stay at the Golden Gate Hotel. Located in the heart of downtown across the street from the Freemont Street Experience, the Golden Gate Hotel was constructed in 1906 with 122 rooms as well as suites which have been recently renovated and sport a contemporary chic interior that has Art Deco ascents. Rooms are 250 square feet with a choice of bedding and suites have more than 400 square feet with an open floorplan that includes a large sectional sofa sleeper. The Golden Gate Hotel is centered in the middle of the action with a lively casino area that attracts which attracts travelers of all ages. The hotel is within walking distance to many attractions in the area that include the Las Vegas Premium Outlets, the King’s Ransom Museum and the Mob Museum. The Golden Gate downtown Las Vegas hotel does not have many amenities like a freshwater swimming pool or fitness center but guests have access to these facilities at the neighboring D Hotel. Dining at the hotel includes the Restaurant at Golden Gate Hotel where you will find all three meals and there is a plethora of dining options within walking distance that includes the Grotto for Italian, the Cadillac Mexican Kitchen and Tequila Bar as well as Vic and Anthony’s Steakhouse. Nightlife is happening at the Golden Gate Hotel with scantily clad waitresses at OneBar as well as Bar Prohibition and you are right in front of the ten story mega light display at the Freemont Street Experience where you will find numerous entertainment venues. 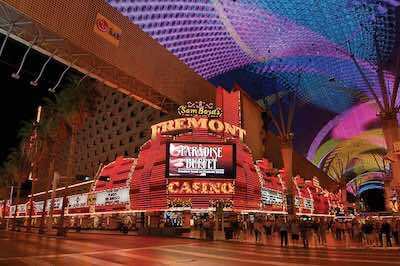 When you are searching for a mid-range downtown Las Vegas hotel that has a lively atmosphere and plenty of entertainment options then you should try the Fremont Hotel. Located in the heart of the Freemont Street Experience, the Freemont Hotel has 447 rooms and suites which boast a contemporary interior. Rooms range in size from 240 to 288 square feet with a choice of bedding and suites offer 544 square feet that contains an open sitting area. The Fremont Hotel has been featured in many movies over the years and the casino area has lively atmosphere with lots of flashing neon inside as well as outside. The Fremont Hotel offers a short walk to many attractions like the Southern Nevada Museum of Fine Art, the King’s Ransom Museum and the SlotsZilla Zip Line. The Fremont downtown Las Vegas hotel does not offer a fitness center or freshwater swimming pool but guests have access to the rooftop swimming pool located at the California Hotel and Casino. Dining onsite features fine dining at Second Street Grill along with casual dining at Tony Roma’s as well as the Paradise Buffet and Cafe as well as quick bites at Lanai Express. Dining choices offsite within walking distance can include Hugo’s Cellar, Nacho Daddy and Pizza Rock. Nightlife and entertainment is plentiful at the Fremont Hotel with a front row seat to the Freemont Street Experience which features nightly fireworks, LED light shows, live music as well as numerous live shows within walking distance such as Marriage Can Be Murder and Defending the Caveman or you can party at the explosive Filament Bar onsite. If you are searching for a quiet atmosphere and value in a downtown Las Vegas hotel that caters primarily to older adults then you should try the California Hotel and Casino. Located 1-block north of the Freemont Street Experience, the California Hotel and Casino has 781 rooms and suites that are furnished with a Hawaiian themed decor. Deluxe and Premium rooms are 264 square feet with a choice of bedding and the West Tower suites are 360 square feet with a small sitting area. 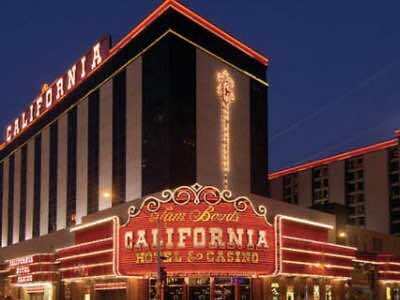 The California Hotel and Casino has more than 1,100 gaming machines which attractions many older adults to the casino and there is not much of a party atmosphere inside the property. There are many attractions within an easy walk from the hotel such as the Freemont Street Zipline, the Smith Center for the Performing Arts and the Neon Museum. The California downtown Las Vegas hotel has a small rooftop freshwater swimming pool with a renovated sundeck but there is not a fitness center onsite. Dining at the hotel includes fine dining at the Redwood Steakhouse along with casual dining at California Noodle House as well as the Market Street Cafe and you will find quick bites at Aloha Specialties. Offsite dining within an easy walk includes Benny’s Smokin’ BBQ and Brews, Vic and Anthony’s Steakhouse as well as the Chart House Restaurant. Nightlife is a short walk away to Hogs N Heifers Saloon or you can catch a live show like Hypnosis Unleashed Starring Kevin Lepine. The El Cortez Hotel is a popular budget downtown Las Vegas hotel with many of the locals living in Las Vegas and is a perfect place that combines Old Vegas with the New Vegas. Located 1-block from the Freemont Street Experience, the El Cortez Hotel is the oldest continually operating hotel in downtown and is listed on the Register of National Historic Places. The El Cortez Hotel was constructed in 1941 with a Spanish Colonial Revival design that contains 361 rooms as well as suites which sport an eclectic Art Deco themed interior. Rooms are available in three areas of the property that include Vintage, the Pavilion and the Tower. Vintage, Pavilion and Tower rooms range in size from 198 square feet to 338 square feet with a choice of bedding and Tower rooms offer a small sitting area. Cabana rooms are 250 square feet with a bright eclectic interior. Suites have between 400 to 550 square feet and are available in several floorplans such as the Designer which boasts a mob chic decor, Cabana Suites have an eclectic interior and Jacuzzi suites boast an in-suite Jacuzzi. The El Cortez Hotel has an interesting history that appeals to guests starting with the days of Bugsy Siegel and Meyer Lansky as owners. The El Cortez Hotel is within walking distance to many attractions that include Alibi Las Vegas, the Container Park and Stars of the Strip. The El Cortez downtown Las Vegas hotel has a fitness center and massages are available but the hotel does not boast a freshwater swimming pool. Dining onsite includes Siegel’s 1941, Siegel’s Gameside and Pizza Lotto. Offsite dining within walking distance ranges from Le Thai to Heart Attack Grill to VegeNation. Nightlife onsite includes live music at the Parlour and Lobby Bar on selected nights and within walking distance you will find the Vanguard Lounge or the Downtown Cocktail Room for libations and the Freemont Country Club has live music. 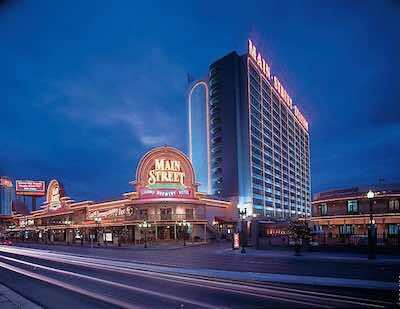 When you are looking for a mid-range downtown Las Vegas hotel that is popular with retirees and travelers who are looking for a quiet place and over 800 gaming machines then you should book at the Main Street Station Hotel and Casino. Located 2-blocks north of the Freemont Street Experience in downtown, the Main Street Station Hotel and Casino has a western style architecture design with 406 rooms and suites that have a Victorian themed interior. Rooms are 400 square feet with a choice of bedding and one-bedroom suites are 642 square feet with a separate living room as well as a wet bar. The Main Street Station Hotel and Casino has a quiet atmosphere and you will be encouraged to take a self-guided tour of the property which contains numerous artifacts of historical memorabilia that range from the Berlin Wall to a snooker table owned by Winston Churchill to stained glass from Lillian Russell’s home. The property is within walking distance to many attractions such as the Mob Museum, the Neon Museum and the King’s Ransom Museum. The Main Street Station downtown Las Vegas hotel does not offer many amenities such as a freshwater swimming pool or fitness center but you can use the facilities at the California Hotel and Casino which is connected by a skywalk. Dining onsite includes the Garden Court Buffet for all three meals and the Triple 7 Restaurant and Microbrewery. Dining offsite within a short distance is plentiful with Pizza Rock for Italian, the Triple George Grill and Hugo’s Cellar. Nightlife is found offsite with Banger Brewing, Bonkerz Comedy Club or you can catch a live performance like Defending the Caveman as well as Marriage Can Be Murder within a short walk of the property. When you want to be in the middle of the action with access to numerous gaming and entertainment venues within walking distance then the D Hotel is a great downtown Las Vegas hotel for you. Located in the heart of downtown directly across the street from the Freemont Street Experience, the D Hotel has 638 rooms and suites that sport a chic contemporary interior that was renovated in 2012. Rooms are 300 square feet with a choice of bedding and corner rooms are available that feature a sofa sleeper. One-bedroom D suites have a separate living room and panoramic views of the skyline as well as mountains. 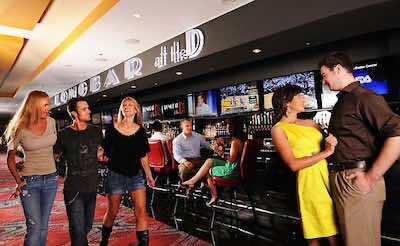 The D Hotel is ideal for all types of travelers including families who want easy access to the numerous entertainment venues within the Freemont Street Experience area as well as Stars of the Strip, Southern Nevada Museum of Fine Art and the Downtown Las Vegas Event Center. The D Hotel boasts a nice freshwater swimming pool, a fitness center and there are two casino areas which include a vintage casino with plenty of penny slot machines. Dining at the D downtown Las Vegas hotel includes the American Coney Island, the Coffee Stand at the D, Andiamo Steakhouse and the D Grill is open 24/7. The D Hotel has several exciting shows are on premise such as Marriage Can Be Murder, Defending the Caveman, Adam’s London’s Laughternoon and the Jokester Comedy Club is full of laughs. There are two distinct lounges which include the Vue Bar in the vintage casino area and the Long Bar which is the longest bar in Las Vegas. 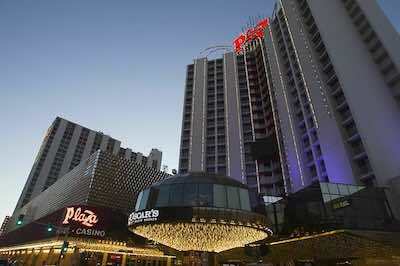 If you are searching for a quality mid-range downtown Las Vegas hotel that boasts everything onsite from comfortable rooms to gaming to live entertainment then the Plaza Hotel and Casino is superb. Located in the heart of downtown just 3-blocks from the Freemont Street Experience, the Plaza Hotel and Casino has 1003 rooms and suites that are furnished with a modern interior. Rooms are 325 square feet with a choice of bedding and poolside rooms boast a patio that offers direct pool access. Junior suites are 400 square feet with an integrated living area and mini-suites have 500 square feet. One and two-bedroom suites range in size from 650 to 1,000 square feet with a separate living room and 1.5 to 2.5-bathrooms as well as nice views of the skyline. The Plaza Hotel and Casino is perfect for all types of travelers including families who want to be close to numerous entertainment venues that are located downtown such as the Container Park, SlotZilla Zip Line Las Vegas as well as Alibi Las Vegas and there are numerous shows within walking distance that range from Laughternoon to the Broadway Rat Pack to the Spirit of the King. The Plaza Hotel and Casino has plenty to do onsite with a renovated freshwater swimming pool that offers cabanas and a pool party on Saturday nights, tennis courts, a fitness center and 24/7 gaming in the casino. The Plaza downtown Las Vegas hotel boasts four restaurants with Hash House a Go Go, Brightside Breakfast and Burgers, Pop Up Pizza, a food court with quick bites and Oscar’s serves up perfect steaks. Entertainment onsite features several quality shows such as the Scintas and the Omaha Lounge has nightly entertainment that ranges from live music to standup comedy. When you are looking for a fresh mid-range boutique downtown Las Vegas hotel that is great for younger adults who are seeking a lively atmosphere then the Thunderbird Hotel is perfect. Located in the Arts District just 1-mile from the Freemont Street Experience, the 100 rooms at the Thunderbird Hotel were renovated in 2016 with an urban chic decor. Rooms are 320 square feet with a choice of bedding and there is a common patio area for people to enjoy. King suites boast more living space and the pool suite offers a kitchenette. The Thunderbird downtown Las Vegas hotel has a nice terrace and garden area for relaxing along with a freshwater swimming pool, fitness center as well as the Royal Wedding Chapel onsite. The Thunderbird Lounge is an ideal place to play billiards, indulge in a cold libation, sing karaoke or pull the handle on a slot machine. The Arts District is known for having one of the best parties on the first Friday of each month. Other attractions nearby include the Gold and Silver Pawn Shop, Las Vegas North Premium Outlets and the Viva Las Vegas Event Center. Restaurants within walking distance include Casa Don Juan for Mexican, the 107 Sky Lounge and Lola’s serves Cajun specialties. If you are seeking a value oriented downtown Las Vegas hotel that offers quick access to the numerous attractions downtown then try the Downtowner Motel. Located 3-blocks from the Freemont Street Experience, the 79 rooms and suites at the Downtowner Motel have recently been renovated with a simple contemporary interior that features a jungle theme. 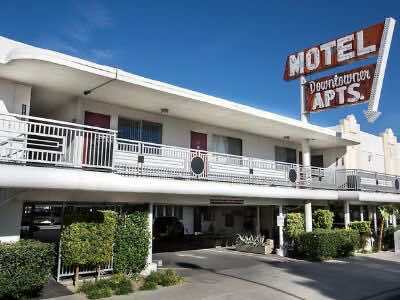 The Downtowner Motel is ideal for people on the go and who are looking for a comfortable place to rest their body. Rooms are on the small side at 140 square feet and there are one-bedroom suites that boast a full kitchen. The property has a freshwater swimming pool surrounded by a sundeck but no other onsite amenities. You will be close to all the nearby action like the Container Park, Mob Museum, the SlotZilla Zip Line Las Vegas and plenty of nightlife at Don’t Tell Mama. There are plenty of eateries within walking distance such as Le Thai, Eat and Carson Kitchen. 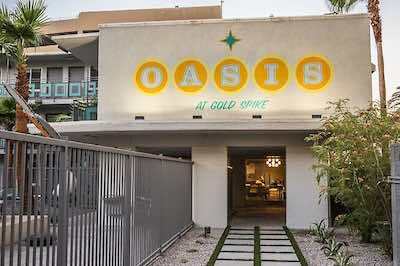 When you are searching for a boutique downtown Las Vegas hotel which is perfect for couples and younger adults then you should book at the Oasis at Gold Spike. Located steps away from the Freemont Street Experience, the 86 rooms and suites at the Oasis at Gold Spike have recently been renovated with an urban chic decor. The smallest rooms are the superior and deluxe with standard bedding and views of the pool area. The ultimate crash pads are larger with a sitting area that features a sofa. There are small houses called Sugar Shacks that are situated in the backyard of the Gold Spike which have 344 square feet on two levels of living space that include a full kitchen, a sofa sleeper and an outdoor patio. The Real World Suite is massive with 5,000 square feet and was featured on MTV’s Real World. This suite has three-bedrooms, 3-bathrooms, a large living room, full kitchen and three rooftop patios. The Oasis at Gold Spike has a lively atmosphere that starts with the freshwater swimming pool area which offers drink service. Other amenities onsite a vinyl library of records that is complete with turntables and there is a fitness center. Adjacent to the Oasis at Gold Spike downtown Las Vegas hotel is the Gold Spike which is open 24/7 with the Carnival Bar as well as the Backyard and Living Room which have lawn games that range from corn hole to shuffle board. 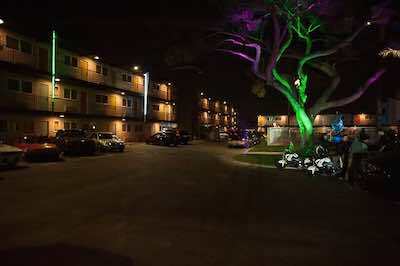 On selected nights there are DJ’s indoor and live music outdoors.